I love this race specialy as its my home town. The weather was good and there were many stalls to check out up the high street. and laughter. I'd like to thank some of the Wrekin Road Runners for waiting and cheering me on to the end. I was also pleased with my time as I was convinced It would take me at least 1hr 50min so was pleased with 1h 40min. Lovely medal, bag and Tee Shirt, plenty of goodies in the bag. Well organised and looking forward to next year! So if you don't mind a few hills and like the challenge of the marathon distance then Brooks Snowdon Marathon is worth every penny. as I'm sure you are aware I have been lucky enough to do London marathon 4 times and it's a great atmosphere and you feel like you are running with the whole world but Snowdon is equally important to me yet the difference is I feel like I'm running the The World. That's why I've now completed 3 and I hope to return for a few years if my body holds out. As long as you put the training in and practice those hills anyone can do it. Yes it's tough and it's reduce me to tears, but everyone that runs are so lovely and friendly. The organisers do a fantastic job and if you don't mind a slate coaster for your efforts and a nice tee you'll also give it a thumbs up. This year, as usual, I did some of my training with 'Super Sally' ( her chosen Snowdon pseudonym) we put a lot of hours in and we just seemed to get on with it. Doing various routes, including hills and tried to get on as many Wrekin runs as possible. We also had the pleasure of Kelly and had a group message to help motivate each other ( that's my job, hehe) We entered a couple of Trail runs to toughen up our legs and minds too. We also ate really well and cut down on alcohol, or a least that's what we told Kelly! So it came to no surprise to us really that we all did much better than previous years. I don't think I can really put into words the whole experience you just need to do it for yourselves but the scenery is awesome, although a bit foggy this year but what I will say is for me the race starts at mile 22 and the rest is all a very long warm up. The crowds are not quite as fierce as a London or Manchester but they still do a very good job at making you feel you are doing and awesome job. Drinks station are every 3 miles and even one serving tea at the top. My first year I thought at this point I was going to die! Not even exaggerating; my second year I had a slower 'warm up' than I would have liked and had a run walk statergy which I was pleased with as I did that part much quicker, this year I can honestly say I ran the whole way....... it was slow.....but I slowly picked other runners ( I'm not into them zombie TV shows but that's what some resembled) , off up that gruelling hill, even over taking runners I'd ran with earlier I was over taking them, I now need to conquer running down the other side!! Which when you do get over and start to run down into the town the people really give you boost. Glorious sunshine, a calm peaceful day and clear blue skies. Unfortunately, that was the weather in Llandudno on Friday. By Saturday morning the sky had clouded over, the wind had blown up and the threat of rain was always present. 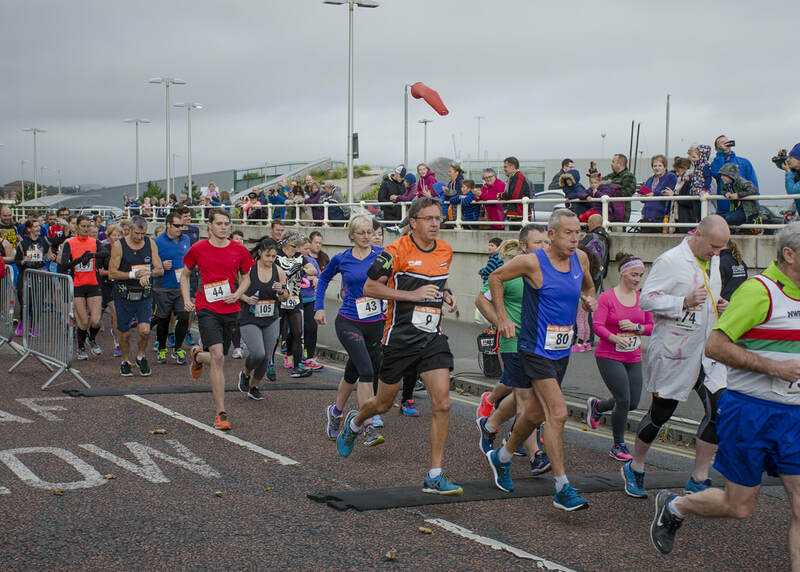 The Porth Eirias 10k begins on the promenade at Colwyn Bay overlooking the beautiful sandy beach. It’s a simple five kilometre run along the North Wales Coastal Path to Llandulas and then back again, with the sea crashing against the shore on one side and the main railway line to Holyhead and the A55 Expressway on the other. The course is relatively flat but there are some steep little inclines that throw in a little challenge around the quarry port. The first five kilometres were a breeze – literally! I felt as if I was floating along and reached the halfway point in 23:33. But, then came the turn and straight away I realised the return to the finish was going to be much more difficult. It felt like we were running straight into the wind. The quick start and the windy conditions began to take their toll and a much slower second half of the race followed. Still, I was quite pleased to finish in a creditable 30th place and second in my age category in a chip time of 48:45. A quick lunch and then it was over to Llanberis to see some real runners finish the Snowdonia Marathon. Well done to all of you. You were awesome! I used to hate cross country for a number of reasons. Only the first three count for the team and I'm not that quick, so I never felt that my effort helped the team. It's a long drive for a short race. Then I picked up an injury and couldn't run them and I started to miss it - the camaraderie, the mud, the laughs. And then a wise man explained to me the physical benefits of running cross country in the winter. It makes us better runners he said. Then we swapped from North Staffs League to North Wales and I fell in love with Cross Country. Race 2 of the year took us to Llandudno. Four cars with 11 runners set out on the two hour journey but only three cars with seven runners made it all the way there. Unfortunately the Gills broke down somewhere near Wrexham and spent the day waiting for a tow truck with Neil, Dan and Lee. The rest of us were left to brave storm Brian alone. With winds gusting at over 50 mph and driving rain, we arrived at St David's College and sat quietly in our cars wondering what we'd done to deserve this. We soon toughened up and the ladies were off at 2pm. The college grounds are beautiful and we did a couple of laps of the rugby pitches before heading up a field and back down again, then tackling the terrace, along a wooded path and into a large field. This has quite an incline but by now storm Brian had picked up again and the wind was at our backs on the uphill. Brilliant! And then we came downhill, into the wind with driving rain piercing our eyes. The bottom of the field had become a bog. Knee deep. I'm not kidding. Finally out of the field, back around the rugby pitches and to the finish. Huddled under Buckley Runners gazebo with five men holding on to stop it being blown away, storm Brian picked up again. Karen and Marie finished in the worst of it and poor Dave and Kris were yet to start and had to run the same route twice. The men ran (they were awesome to watch), the ladies cheered through chattering teeth, we submitted our results, changed into dry clothes and headed into town for fish and chips. They were good. We were good. There are five races in the series, so please join the team to run or cheer when you can. The ladies are currently in 10th place out of 15 teams. The depleted men's team still managed to beat TAC on Saturday but are currently sitting in last place overall. A full team and a reliable car is all that is stopping WRR from taking on the world, well North Wales at least. I don’t do Trails and I don’t like hills so what was I doing running this trail run which advertises itself as ‘including a few hills to offer a small challenge around the course?’ Simple: this event offered the opportunity to be part of a meet up of UK Cardiac Athletes, part of the world’s largest online community for sporting heart patients. The Thoresby10 is an annual autumnal trail run in the beautiful grounds of Thoresby Hall, north Nottinghamshire. There are races over 5k, 10k or 10miles, running along old military roads, cleared tracks through ancient woodland and grassed paths around the country estate. There is also a Canicross event at each of these distances. Saturday was probably not the best preparation I’ve ever had before a race. A get together of about twenty of the group had been arranged at a pub in Southwell. Although I’m usually careful about what I eat and drink the night before a race, this weekend was more about meeting with other runners who have a range of heart conditions and getting to know people I had only been in contact with online, so a good meal was eaten and a few pints consumed. Nevertheless, after a good night’s sleep I was eagerly looking forward to the run. 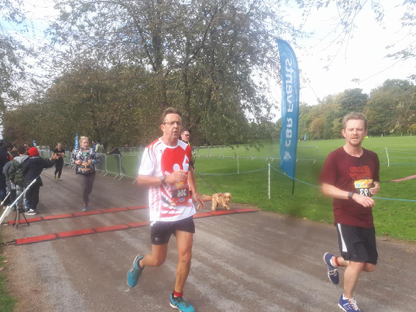 The event was superbly organised with over one thousand runners taking part in the events, along with what seemed like hundreds of dogs. First off were the 10 mile runners and then the 10K runners followed twenty minutes later, followed later by the 5k runners. After a short downhill start the course quickly flattened out onto grass tracks around the lake and then through woodland. There were a few stretches of compacted stones and concrete paths as well as the occasional gentle hill but thankfully the wooded areas offered a lot of protection against the blustery winds until the last mile or so when the path opened out across open fields. The last mile looked as if it was going to be a fast downhill stretch until the hall came into view and the final few hundred yards became a struggle up, what I am sure was probably only a gentle slope. It didn’t seem like that at the end of a race. There were good crowds cheering runners to the finish line as 5k, 10k and 10 mile runners crossed the line, with volunteers ready to hand out a well constructed finishers’ medal. This was a good event, which was well organised and supported. I am sure Cardiac Athletes will be gathering for this event again next year and it’s the sort of event that many club members, particularly those who like to run with their dogs, would enjoy. I will be going again next year and will probably run the ten mile event. Perhaps, we should send out an invitation to Cardiac Athletes for next year’s Apley Estates run. Personally, it was disappointing to drop to slower than fifty minutes but I was pleased with my run in what I consider to be alien conditions. Of the 459 10k runners I finished in a creditable 38th position and second in my age category. For our second overseas marathon of the year, Sarah and I travelled to the Portuguese capital Lisbon in order to take part in the Rock and Roll Lisbon Marathon on Sunday 15th October. We flew from Liverpool on Friday morning and after checking into our hotel we travelled on the cities excellent metro out to the expo which was located at Parque das Nações area. We have only taken part in one Rock and Roll before (Liverpool) and whilst our number pick up went smoothly we were a little disappointed with expo over all, there were only a handful of trade stands and the only other marathons being promoted were the other three European Rock and Roll marathons. We collected our race shirts; Sarah was a little disappointed that they only had vest style tops for women whereas she would have preferred a t-shirt like those given to male competitors. We were in and out of the expo within half hour. We did enjoy a cable car ride and marvel at Europe’s longest bridge the 7.6 mile long Vasco da Gama Bridge whilst in the area. On Saturday, we took in the sites of Lisbon and enjoyed exploring the quaint streets and districts of the old parts of the city. We ended up walking over 13 miles, hardly the best preparation for running a marathon the next day. We found a nice Italian restaurant for a pre-race carb loading. We were up ridiculously early on race day in order to get a taxi from our Hotel to Cais do Sodré railway station from where we had to catch a train for the 40 minute ride to the marathon start in Cascais. We were amused by the numbers of rather inebriated revellers near in the Cais do Sodré area, we had just got up to go and run a marathon, they had obviously been up all night partaking in a drinking marathon. The train was full of runners making their way to the start, train and metro travel was free for all marathon runners throughout the day of the race. We arrived at Cascais just over an hour before the start of the race, we had a ten minute walk from the train station to the start area, although it was still dark it was already warm and humid, we were entertained by a local who kept shouting at the passing athletes ‘Why, Why, Why, I don’t get it’. Once in the start area we had time to drop off Sarah’s kit bag which once the race started would be transported to the finish, and join the queue for the porta loos. At 8:30 we were given a very brief countdown I think it was basically 3,2,1 and the starting hooted was sounded and we were off, well actually we shuffled slowly forward for the best part of three minutes until we reached the start line and then we were off. The first 12 kilometres or so of the race is an out and back from Cascais along the shoreline and back. As in any big marathon these days numerous male runners made a dash for walls or trees in order to urinate, with more women than I usually see dashing into the undergrowth alongside the route to presumably do the same. There really is no excuse for this behaviour as there were plenty of porta loos at the start and along the course. One of the good things about the out and back was that we got to see the elite front runners come past in the opposite direction, already several kilometres ahead. After passing back through Cascais we continued to run along the Atlantic shore line following roads through seaside towns and past golden beaches, being a Rock and Roll event there were live bands playing at points along the course although not as many as I was expecting. There were apparently 22 bands between the marathon and half marathon courses. In this event the half marathon unusually have a completely different course to the marathon with the two routes only coming together when approaching the finish funnel with a couple of hundred feet to go. As the sun rose it became hotter and hotter with the temperature eventually reaching 30 degrees, fortunately there were water stations every 2.5 kilometres, I don’t think I have ever drunk so much water during a marathon before. Sarah and I decided to run the race together, the fact Sarah ran it at all is incredible given that she had been unable to train due to a foot injury throughout the summer, and had only run a maximum of 20 miles altogether in the 3 months preceding the race. Given the heat we decide adopt a sensible approach and set off at a conservative pace. We chatted to other British runners as either we passed them or they passed us, including a mother and daughter who are members of the 100 marathon club and who are going for a world record of the most number of marathons completed by a mother and daughter running together, they will break the record in a few weeks’ time when they run their 100th marathon together, at the New York Marathon. As the temperature rose I started to crave a Calippo ice lolly, which have become a firm favourite race food of mine, especially during long ultra races. I think I know every place from which you buy them on the 145-mile Birmingham to London Grand Union Canal Race. Then just ahead on the right I spotted the distinctive red livery of a Wall’s Ice Cream Van, my prayers were about to be answered, only to be well and truly dashed by the realisation that what I had mistaken for the classic British Ice Cream Van, was in fact a Portuguese ambulance. We saw numerous ambulances during the race many of them having collapsed runner’s hooked up to IV infusions being loaded onto them, it seemed our plan to run sensibly and slowly was well founded. Although I didn’t manage to get a Calippo from the ambulances some of the aid stations did offer segments of fresh orange, which were nice and refreshing altogh as Sarah went to get one she realised it had already been picked up by an earlier runner who had taken a bite and put it back onto the table, YUCK! Thankfully, she realised before putting it to her mouth. On we plodded alternating running with short walking breaks. Although we weren’t especially bothered about our time I did think that a sub five hour finish would be nice and with a few miles to go we seemed to be on target to achieve this. But then the 5 hour pacer came past us and I thought we had blown the sub five, but wait according to my watch, the kilometre markers and our pace I figured we would finish with a few minutes to spare. The pacer it seemed had got his pacing wrong, those who managed to stick with him were probably on for a nice personal best but I suspect he dropped more than a few runners along the way given his pace as he passed us. After what seemed like forever the building of the Praça do Comércio where the finish line was sited came into view. We were nearly there; but as we made the left turn into the square, we realised that we were not going to cross the finish line. However, we would have to run right through the square and into the streets behind where we would do a loop, our route meeting and running alongside the half marathon course, before turning back into the square and eventually across the finish line. We crossed the line together in 4:53:01 and 4:53:02 Sarah somehow managing to beat me by one whole second. We were presented with our medals and then as if in answer to my prayers a Calippo ice-lolly, the best marathon finish line goody I have ever been given. After the race we eventually managed to work out where the baggage reclaim was and made our way to the nearest McDonalds for our now traditional post-race meal. We later met up with fellow Wrekin Road Runner Amanda Ellis who had run the half marathon for a celebratory drink and obligatory club photo. The race promotes itself as being the most picturesque in Europe. This is a tall claim and one with which I would disagree. There are nice sections along the coastline past nice beaches and through picturesque seaside towns, but equally some boring stretches through industrial areas. We really liked the city of Lisbon and going there to run a marathon is a great excuse to do so. I would love to visit the area again but probably would not choose to run the marathon again, don’t get me wrong I enjoyed it and it was worth going to do. I might however be tempted (shock and horror) to go and the run the half as I really fancy running over the Vasco da Gama bridge. Next stop Snowdonia where hopefully it will not be quite as warm. ​When this race was annnounced last year, having spent much of my time in Brum, I thought now would be a good time to try and make the start line of my second marathon, after the first being London 2015 ( through the club ballot) I wanted my second to be something big. With being prone to calf and cramp issues I started a very long plan to build up very slow, and try different things to try and prevent the cramp. All training went well up to just under 18 miles which I did the 3rd week of August, then boom calf went and off to the physio I went ( Scott Gromley Newport), and the plan to at least make the start began, where the bike at the gym become my friend. I watched the 8.30am guys go, then meltdown that I can't do this, they announced at the start its nice and easy into the city centre, and dont worry that the finish is slightly higher than the start. Off we go started by the 106 year old, who didnt even take up running untill age 80. Inspiational. Off we go, all i wanted through the plan was sub 5hr, which with the injury had to be adjusted to just complete, the monkey on my shoulder was telling me I wont and I was allowing it to reamin there. Mile 1 nice and flat, then I thought we been told some porkies as up we went, then down, then up,and up and up. When In the city at around 5 miles I was convinced I could not do this and went to stop and quit, but managed to get a downhill and i had a shout out from Kelly and Donna which got me going, then yes, we started going up into Digbeth, mile 8 the 4.30 pacer was next to me. I hung on for about a mile, then as they went away, heart sank and this early on was really struggling and the missing miles recently were showing, but thankfully no sign of cramp. Off down the Pershore road and then mile 12 a nasty hill at Bournville, then I saw the train station, but dam had no money. 14 come a monster hill, with a convent at the top, I needed all the Hail Mary's going. A nice down hill followed, and as i was really struggling mentally a big decision was soon to be made, if to turn off and do it all again, knowing what was coming, ready to detach my number and accept marathons are not for me, I somehow with support of some local faces, peeled off right, and thought what the hell am I doing I was walking at this point and garmin was ready to die. A good friend then caught me up and said lets finish this together, and decided to walk run, set plan 2 mins run 1 walk. mile 19 and I knew I was going to at least finish, my mate was struggling and told me to go on. Knowing i was close to breaking point, sweating feeling a little odd twinge in my calf, i tried running to the bottom of the hills then walking, mile 21 I was offered a Gin and Tonic (yes, a family had loads of bottles and was making them up on a table) stocks were going down. Mile 22 and the final massive hill and few more " Hail Marys on the top" i knew apart from the end the hills were over. Mile 23 I thought just a parkrun, by this time the half marathon runners were on the other side, so I moved over incase to see any gave me a spurt, and it did some great shout outs from the guys and other local club runners. I thought just a park run, I mean I have done 187 of them how hard can it be, I started to run a bit stronger, the lovely Sonia Edmonds come past and tried to keep me going as appartly sub 5 was still possible, I had no clue as Garmin dies from mile 19. I started to get a little cramp in my calf, which felt almost nice, as I always cramp in hamstring and this was ok to run through, mile 25 come but at this point i was out with the washing, trying to move out the way of the first finishers of the half but legs were giving way and was every chance I would take one of them out. One final nasty climb, I get to the top and had about 800m to go, but I couldn't take another step and even this close thought I won't do it, but the shouting from the crowds made me start to run, then I saw the Wrekin guys so made sure I ran past then when I thought I was out of sight I can walk across the line, then one of my best friends was screaming to run as they had seen the clock! I managed to cross the line and without having my garmin to know how many mins after 9.30 I started, I couldn't have had a PB. Totally not with it at the end, walked past the baggage busses, looking for them. i got my phone and first thing logged in to check the result and I managed a PB of 5hr 10 mins exactly ( think they added a second on since) and 3 mns off London! Massive respect to everyone who completed this in warm conditions. The club support on route was amazing, well wishes before and after were heart warming. First one of the season and the weather was kind to us as we ventured over the border. If you didn’t already know I love Cross Country so really look forward to the new season. This is proper racing – No medals, no t-shirts – just racing. All dates are in my calendar just so the Wife doesn’t double book it. 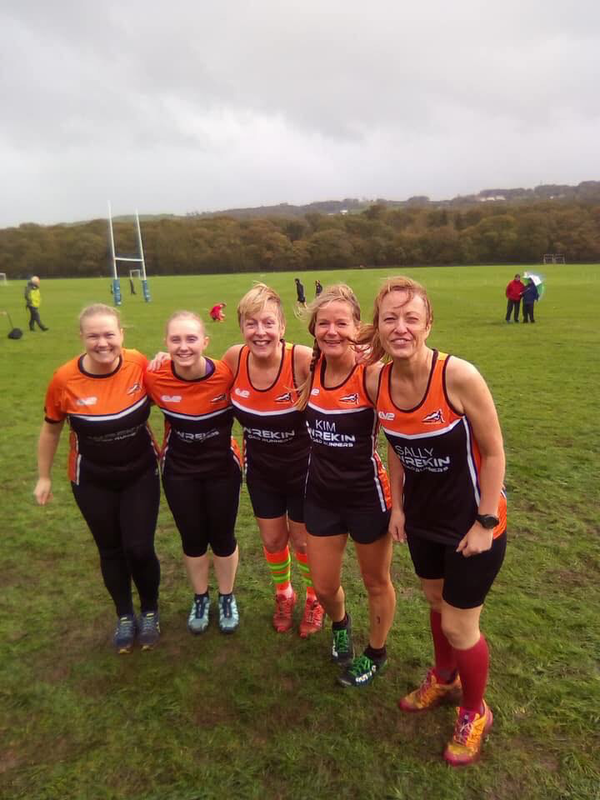 We had 6 ladies and 6 men available for the fixture with a few debutants taking the plunge. The course for the ladies was one small loop and two big loops and the men four big loops and the venue a school playing fields. The course was pretty much flat and dry underfoot so lent to quick times. No hills at all - ☹. No mud ☹. Some may say that’s good but I like the hills and the mud as it challenges you in different ways. It tests your leg strength more, it tests your resilience more and it tests your balance. There was some great running from the ladies and the men. Lots of smiling faces, or were they grimaces? All seemed happy with their performances and there is nothing like watching a good all fashioned sprint finish (every place counts in the team standings). On a personal note I was chuffed to bits to run such a time on my return from injury and have targeted myself to move up the field over the season. Onwards and upwards to the next race – 21st October – Llandudno – Who fancies joining us?